on 14 February 2015 . Congratulations to the K1N team, they did an outstanding job under difficult conditions. It’s official! The documents were received on February 4th granting us the call sign TX3X. With the addition of Arnie N6HC we completed staffing the on-island team. Arnie, a well known DX-peditoner, has participated on the following DX-peditions: K7C-Kure atoll (2005), 3B7C- St. Brandon Island (2007), TX5C- Clipperton Island (2008), K4M-Midway Island (2009), T31A- Kanton atoll, Central Kiribati (2011), T32C- Christmas Island, Eastern Kiribati (2011), NH8S-Swains Island (2012), T33A-Banaba (2013) and FT5ZM-Amsterdam Island (2014). In addition to his radio operator responsibilities Arnie will be our team doctor. on 03 January 2015 . 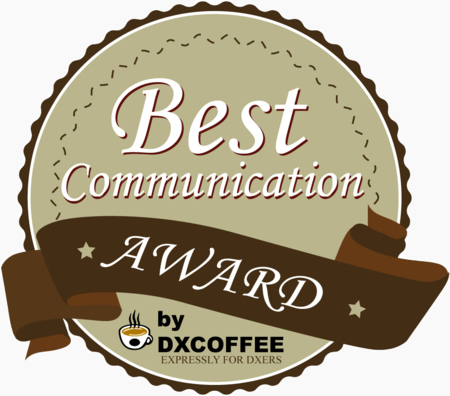 2015 / 2016 are shaping up to be one of the best ever DX-pedition seasons. 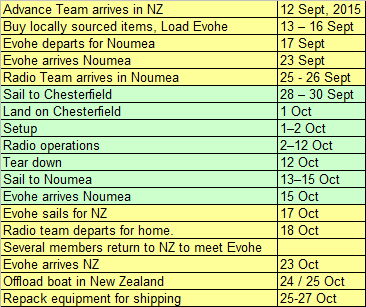 Along with the skipper of Evohe we developed our tentative sailing schedule. We will ship equipment to Auckland, New Zealand where the boat will be loaded and sail for Noumea, New Caledonia. Sailing in the Coral Sea is always a challenge, avoiding the cyclone season is a top priority. on 20 September 2014 .